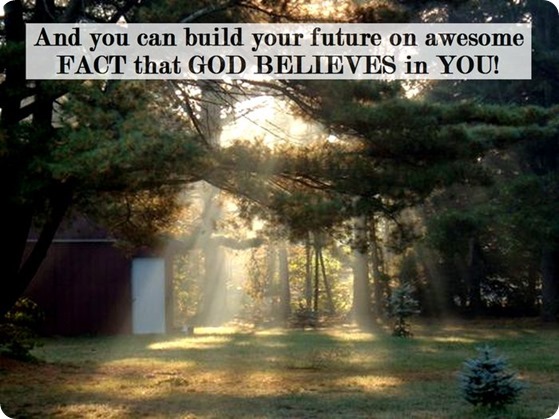 God believes in you! God believes in you not because at some point in the past you’ve “crashed and burned” but because of what the Holy Spirit is doing in your life right now. God’s belief in you is so grounded in the life of Jesus that even when you don’t believe in him he continues to be faithful to the love and faith already invested in you through the life of Jesus. There are times in our lives when we find ourselves wandering in a dark jungle of our own making and God seems a million miles away yet when we find time to look back on our life there are genuine times when God displayed his belief in us through blessings. This morning let’s look at another aspect of prayer closely connected with yesterday’s aspect of praising and thanking first. The prayer I am talking about comes out of taking an honest look back on our lives and discovering God did indeed “go beyond the distance” for us. And as we remember and rehearse God’s past blessings through the words of a prayer we will suddenly find ourselves walking in the light of God not in some self-created dark jungle. And by the way – the same God the Psalmist reflects on is the same God that believes in your and is NOW intimately at work in your life, and you can build your future on awesome FACT that GOD BELIEVES in YOU today!